The editor, Ogawa Enson (Tachiro, 1877-? ), was a novelist and playwright. His younger brother was the painter Ogawa Sen'yo (Tasaburo, 1882-1971). 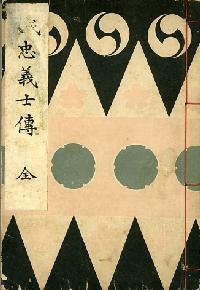 It is not clear what role Ogawa played in the compilation of this volume, which was published and printed under the direction of the "Color picture division" of the "Customs, picture scrolls, and drawings publishing association", a group which reproduced compact editions of several late Edo and early Meiji woodblock print sets during the Taisho period. 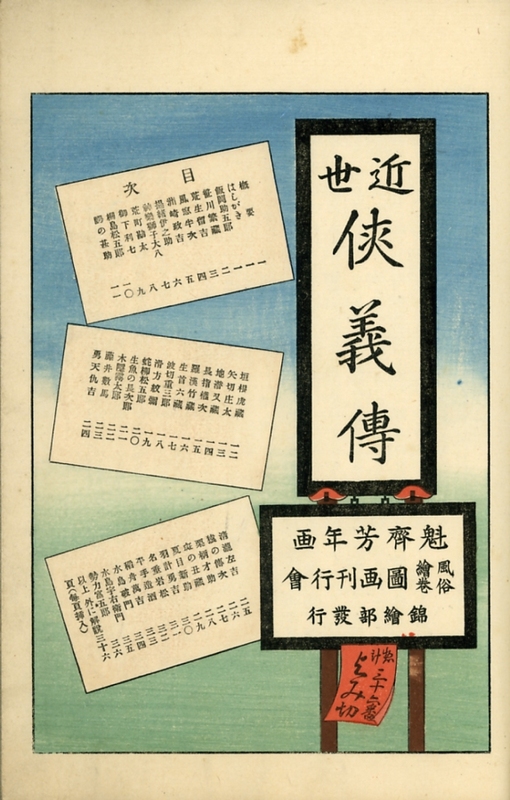 This volume is the third in a series of six "nishikie bunko" (color woodblock print pocket books), according to an advertisement on the last page. Kinsei kyogi den is usually dubbed "Biographies of Modern Men" in English. The translation is short, simple, and misleading. The men were not "modern", the stories are not "biographies", and the most important word -- chivalry -- has been lost. Kinsei (近世) means "recent times" or "recent world/life" and may also imply "contemporary" but with a "near past" more than "now" focus. Kyogi (侠義) means "chivalry" (today more commonly "gikyo"), especially in codes of honor among gamblers and others who make their livings on the fringes of the law. Den (傳 / 伝) is a "received story" or "episode" from real life or legend and is best not translated "life of" or "biography of" when not following someone's name. The original prints were printed on oban (roughly B4) sheets and feature text integrated with foreground and background images. The reproductions in this book are about half the size of the originals but feature only the foreground image, without the background image or text. The reproduced images are very high quality copies of the originals. They show that the skills of Taisho woodblock carvers and printers are on a par with those of their late Edo antecedents. While page size is roughly half the original sheet size, the reproduced images are about three-quarters the size of the original foreground images. Each picture page is faced by a story page. The story text is not, however, a transcription of the original text by Sansantei Arindo. In fact, his name does not appear in the book -- as though he and his stories never existed. The name of the original carver and publisher are not mentioned either -- as though only Yoshitoshi had created and published the original prints. The compilers of this volume clearly had more in mind than merely reproducing Yoshitoshi's and Sansantei's work. The names of some of the characters who figure in the episodes also differ. Some of the stories describing their feats bear little resemblance to Sansantei's stories. Even the images, though generally very faithful, may have undergone a certain amount of editing to reflect what the editors regard as differences in taste between late Edo and Taisho. In a word, despite their late Edo roots, the prints and stories in this book are Taisho reincarnations -- of, by, and for denizens of the Taisho period. And as such they are a Taisho, rather than truly contemporary, mirror of the 1860s when the original prints were published, and of the 1840s whose events the prints narrate through their pictures and texts. The contents of the 76 pages between the covers of this book of reproductions are as follows. A single wood-block-printed page shows the title and publishing credits. Three cartouches list the 36 persons (all men, no women) whose chivalrous acts are shown and narrated in the pictures and stories. The picture and story pages for each person face each other, and both pages are given the same number, 1 through 36. A single-page article entitled Kinsei kyogi den gaiyo [Overview of Stories of chivalry in recent times] introduces Sukegoro and Shigezo, the two rivals who were at the center of a turf war that caught the attention of the Kanto area centering on Edo. The first sentence translates as follows. At the time of Tenpo [1830-1844], the chivalrous gambler [kyokaku] Sukegoro of Iioka in Shimosa, and Shigezo of Sasagawa, were both heard-of bosses [oyabun], and they were always getting their antlers up in power struggles over matters concerning [their] natural territories and such. 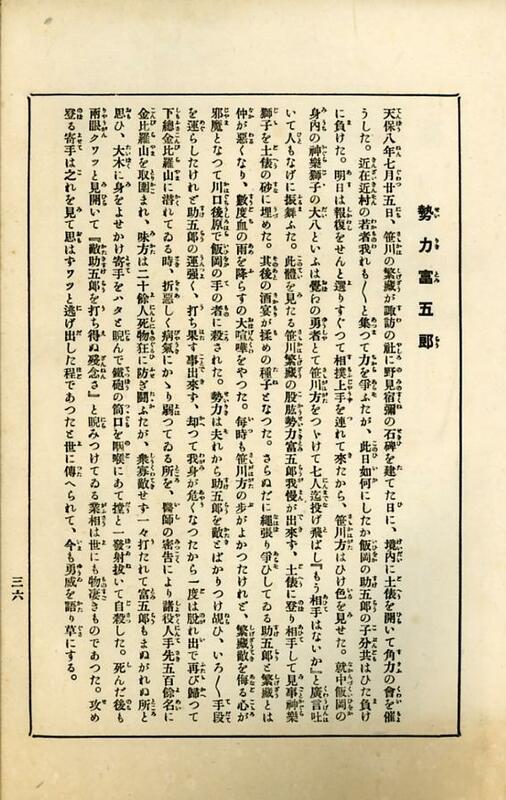 A single-page article entitled Kinsei kyogi den hashigaki [Stories of chivalry in recent times preface], attributed to the editors and dated the 9th month of the 6th year of Taisho (September 1917), introduces the prints in relation to the times in which they were published, meaning both late Edo (original prints) and Taisho (reproductions). The last two paragraphs translate as follows. * The ukiyoe master Yoshitoshi gave birth to these characters from the tip of his brush to paper. As ukiyoe of a decadent age they had befitting themes. Accordingly even among Yoshitoshi's productions Kinsei kyogiden is [just one of] several [such] works. 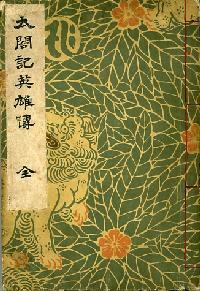 * [We] have reproduced these [ukiyoe and the result] is this book. However, excess brutality and excess obscenity [we] have avoided in this book. For there are considerable differences regarding manners and mores [fuzoku dotoku] between Japan in the present age and Japan in the age of Yoshitoshi's kyogiden. The first two men featured in this volume are Iioka no Sukegoro and Sasagawa no Shigezo, the two men at the center of the conflict. The rivalry between Sukegoro and Shigezo unfolds in the northeast corner of present-day Chiba prefecture, where the Tonegawa, Japan's second longest river (after Shinanogawa), spills into the Pacific. Ishiwata Sukegoro (1792-1859), aka Iioka no Sukegoro, migrated from Sagami around Yokosuka in present-day Kanagawa prefecture to Iioka, now Iioka-machi on the Pacific coast in Kaijo-gun next to Katori-gun in Chiba prefecture. Sukegoro became a boss of fishermen [amimoto] there, and extended his influence in the Tonegawa basin when he succeeded to the territory of Choshi no Gorozo, in Choshi, now part of Choshi city in Chiba prefecture, which gave him control of ports along the Tonegawa near and at its mouth. He was also authorized to carry a truncheon [jute] and otherwise help keep the peace as an officer of the Kanto Torishimari Shutsuyaku, the police network set up by the Bakufu in 1805 to keep order in eight Kanto provinces except Mito. This fisherman / portmaster / arrestor [okappiki] also became a gambler [bakuto] and then the boss [oyabun] of gambling operations the area. Iwase Shigezo (1810-1847), aka Sasagawa no Shigezo, was born in Sasagawa in present-day Tonosho-machi in Katori-gun in Chiba prefecture, the basin of the Sasagawa river, a local tributary to the Tonegawa. He went to Edo to be a sumo wrestler but didn't seem to have what it takes and returned to Sasagawa, where he became a gambler and then the boss of local gambling operations. During the 8th month of Tenpo 15 (Koka 1, 1844), a representative of a number of villages requested the Kanto Torishimari Shutsuyaku to arrest Sasagawa no Shigezo. Shigezo took the initiative and went after his would-be arrestor, Iioka no Sukegoro. Sukegoro, though seemingly in a stronger position, lost this first round of what became an all-out melee between the two groups. The showdown is known by a number of dramatic names but is most simply called the Tonegawa War. Though Shigezo came out of the skirmish with his life, he lost his principle bodyguard and bouncer, Hirate Miki (1809?-1844), an alcoholic samurai who is himself the subject of considerable stage, song, and movie lore. Shigezo left Shimosa for a while but returned. Sukegoro, determined to settle accounts, used his network of informants to close in on his territorial rival turned archenemy. In 1847, Shigezo was cut down in a night attack by three assassins working for Sukegoro. His head was buried near a large hackberry tree [enoki] at Teikeiji temple in Iioka. Some years later Sukegoro's wife built a grave so people could make offerings, but Sukegoro buried the gravestone. The stone was excavated in 1933 in the course of repairing a road. The inscription of the gravestone read Seigan Han'yu Shinji (清岩繁勇信士) -- a Buddhist posthumous name. Seigan means "pure rock" -- "gan" (rock) being the Sino-Japanese reading of "iwa" in Iwase, his family name. Han'yu means "exceeding courage" -- "han" (florish) being the Sino-Japanese reading of "shige" in Shigezo, his personal name. Shinji means "man who believes", commonly used in male posthumous names, in contrast with "shinnyo" for women. A "Sasagawa no Shigezo no kubizuka" (Tomb of the head of Sasagawa no Shigezo) has been erected near the site of the excavation. And there is a "Shigezo no hi" (Shigezo cenotaph) at Enmeiji in Sasagawa. At Suwa Jinja in Sasagawa in Tonosho is a cenotaph for Nomi no Sukune, a hero during the reign of Emperor Sunnin and founder of sumo who came to be worshipped as the Shinto god of sumo. Shigezo is credited with erecting the cenotaph in 1842 and then holding a sumo tournament before it, as a dedication to Nomi no Sukune and sumo. A festival featuring a tournament is now held at the shrine every fall. Shigezo was a wrestler to the end. 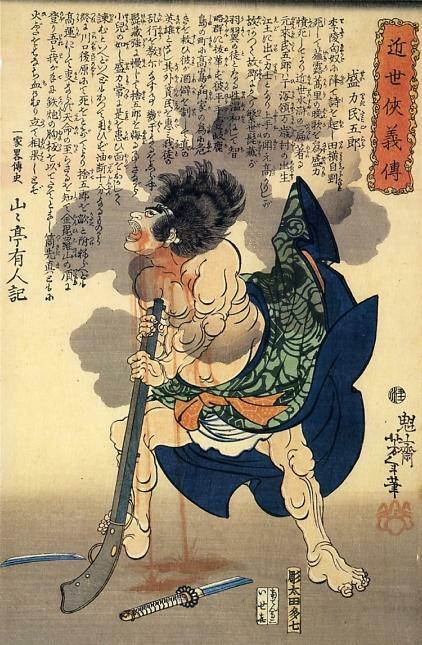 Note that whereas Yoshitoshi has "Iioka no Sutegoro" (飯岳捨五郎), the reproduction calls him "Iioka no Sukegoro" (飯岡助五郎). The latter name came to be established by no later than 1888, with the publication of Tenpo Suiko den, edited by Tagaki Ichin [tentative reading, dates unknown] and illustrated by Ogata Gekko (1859-1920). After Shigezo was assassinated, his followers set out to avenge his death. The last three prints are of the brothers Mizushima Hamon and Mizushima Uemon, and Seiriki Tomigoro, all of whom end up killing themselves. Shibata Sasuke (d1849), aka Seiriki Tomigoro, succeeded Shigezo to become the second head (in effect boss, oyabun) of the Sasagawa family. In 1849, after failing to avenge his Shigezo's murder, and surrounded by Sukegoro's followers, Tomigoro shot (some accounts say stabbed) himself on the top of Konpirasan in Kominami village in present-day Tonosho, after two of his allies, the Mizushima brothers, had stabbed each other. He was 28. In 1874, villagers erected a "Seiriki Reijin" memorial on top of Konpirasan, thus investing Tomigoro's spirit with the power to fulfill visitors' wishes. In 1928, a stone memorializing Tomigoro was erected at Enmeiji in Sasagawa. The whole area is dotted with graves and other monuments marking the feats and deaths of Sukegoro and Shigezo, and their many followers. Considerable sympathy is shown Shigezo and his followers as popular underdogs, because they resisted Sukegoro's abuse of his public office to advance his private interests. Similar sympathies are shown the heroes of Chushingura, the loyal retainers of Asano Naganori, the lord of Ako, whose violation of protocol in the presence of Kira Yoshinaka, a member of the nobility, was provoked by Kira's bullying. The rivalry between Sukegoro and Shigezo would ordinarly not have led to violence had both men accepted the shifting boundaries of their gambling empires. Both men, though, seem to have been anxious to expand into their rival's territory, and apparently both resorted to strong-arm tactics to achieve their goals. Whether Shigezo committed acts that required the intervention as a law enforcer, or whether Sukegoro encouraged people to make charges against Shigezo so he could use his office to move against him, is not clear. Either way, Sukegoro had a serious conflict of interest, in that he coveted opportunities to take over Shigezo's territory, and also had the authority to arrest him. In the many versions of Chushingura, based on historical incidents which took place during the first decade of the 18th century, Asano was ordered to execute himself by seppuku when, provoked by verbal abusive, he drew his sword on Kira in violation of protocol. Asano's family was punished by dissolving the Ako domain, which left its retainers without a master. To avenge Asano's death, some former Ako retainers carried out an attack on Kira's Edo residence and killed him. As their vendetta had been illegal, they were arrested and ordered to execute themselves, which they did en masse under supervision of the authorities. Had Shigezo's followers succeeded in taking Sukegoro's head before they killed themselves, their story would have had even more parallels with Chushingura. The main difference, then, would have been in their manner of death. The Mizushimas and Tomigoro committed suicide when cornered in battle. The retainers involved in the vendetta against Kira did not commit suicide but executed themselves in accordance with laws pertaining to crimes committed by members of the samurai caste. Had the Mizushimas and Tomigoro killed Sukegoro and been arrested, they would have been beheaded as commoners guilty of committing the higher of two degrees of capital offenses. Lower degree capital offenses were punished by hanging. They would have not been ordered to commit seppuku, as self-execution (jisai) was reserved for members of the samurai caste. Note that whereas Yoshitoshi has "Seiriki Tamigoro" (盛力民五郎), the reproduction calls him "Seiriki Tomigoro" (勢力富五郎). The latter name came to be established by no later than 1888, with the publication of Tenpo Suiko den, edited by Tagaki Ichin [tentative reading, dates unknown] and illustrated by Ogata Gekko (1859-1920). The rivalry between Sukegoro and Shigezo is the stage for a long list of Zatoichi movies, beginning with Zatoichi monogatari [The Tales of Zatoichi, aka Zatoichi Story, aka Zatoichi: The Life and Opinions of Masseur Ichi] and Zoku Zatoichi monogatari [The Tale of Zatoichi Continues]. Both of these films, the first directed by Misumi Kenji, the sequel by Mori Kazuo, were released by Daiei in 1962. Zatoichi is played in these and subsequent edisodes in the Zatoichi film series by Katsu Shintaro. Takeshi Kitano plays Zatoichi in his own 2003 production. The Zatoichi character is supposedly based on a man in Sukegoro's camp who was blind but had uncanny intuitions when it came to gambling. Whether the real-life Zatoichi got the girl in the end is not known. Zatoichi films are only the most recent "spinoffs" of the Tonegawa turf war, which is better known as Tenpo Suiko den (天保水滸伝). Tenpo refers to the period (1830-1844) at the end of which the Tonegawa saga unfolded. Suiko den is the Sino-Japanese reading of characters which, in present-day Chinese, read Shuihu zhuan, the title of a Ming dynasty novel by Shi Naian (1296?-1370?) and/or Luo Guanzhong (c1330-1400), featuring stories of heroic outlaws who battled against corrupt officials during the Song dynasty. "Suiko den" is therefore a metaphor for stories about underdogs who fight for justice. Any story with a title of the formula "XYZ Suiko den" will be a romantic adventure about people who rebel to improve the lot of the poor in their struggle against authorities who get rich through their abuse of the common people. "Shuihu zhuan / Suiko den" is often translated "The Water Margin" or "Outlaws of the Marsh" in English, reflecting the setting of the stories in "suiko" or the damp fringes of a body of water, such as the edges or banks of a river or lake, or the lims of a marsh. Shuihu zhuan is about a group of 108 bandits, led by Song Jiang (宋江), who rebelled against injustice from their base in Liangshan swamp (梁山泊) in the Liangshan mountains in 1119-1121. Though fictionalized, its characters and their deeds are based on historical figures and events. "Suiko den" this and "Suiko den" that have been enormously popular in the fableizing of popular heroes in Japan. 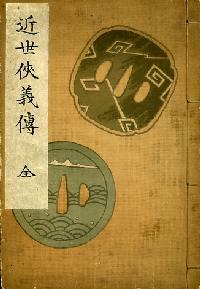 Numerous movies, comics, animated films, and computer games have been spun from the threads of Chinese and Japanese "Suiko den" stories. Yoshitoshi's Kinsei kyogi den was among the earliest attempts to convey the stories of the Tonegawa war in pictures accompanied by text. 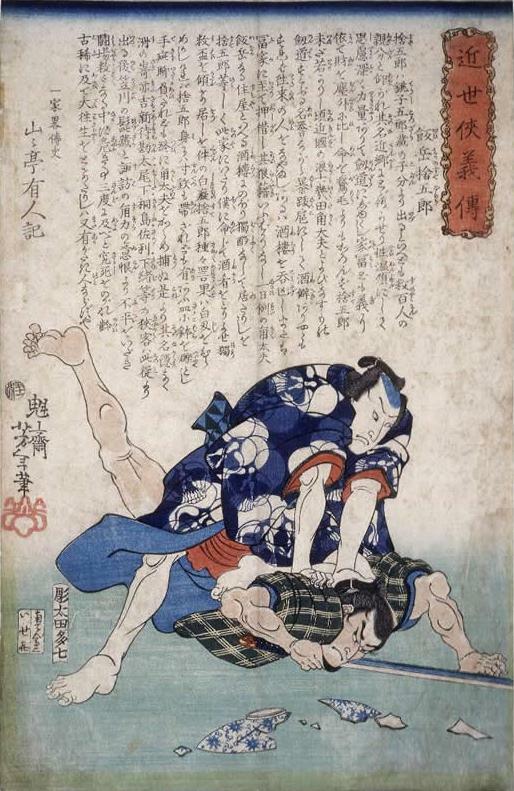 Yoshitoshi designed the series barely two decades after the confrontations between Sukegoro and Shigezo (1844-1849). Sukegoro, who died in 1859, had been dead only six years when Yoshitoshi drew "Iioka no Sutegoro" in 1865. In some sense, then, Kinsei kyogi den was a visual recap of recent news with running commentary by Sansantei Arindo. The Meiji period saw the publication of longer, better researched rehashings of the Tonegawa war, such as Tenpo Suiko den, a 254-page account published in 1888 by Bunshodo. Edited by Tagaki Ichin [tentative reading, dates unknown] and illustrated by Ogata Gekko (1859-1920), this book reflects presumably more accurate versons of names that, in Yoshitoshi's time, had become corrupted by dialect and errors in oral transmission. Tenpo Suiko den is also the title of a naniwabushi (浪花節), or rokyoku (浪曲), a story usually narrated by a solo reciter to the accompaniment of a single shamisen. Naniwabushi seem to have originated as a form of popular entertainment in Osaka during the middle of the Tokugawa period and then spread to Edo. Since naniwabushi stories are typically sentimental, "naniwabushi" has become a metaphor for a tear-jerker about morality and self-sacrifice. 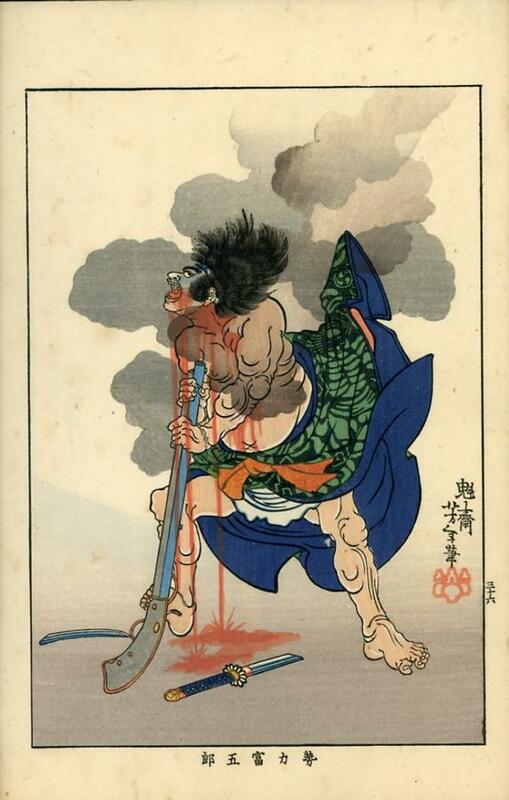 Some Naniwabushi are full of martial bravado, and others are bawdy. And so "naniwabushi" also connotes militaristic, vulgar, rural, or otherwise tasteless, low-class, and out-of-date. Years before becoming prime minister, Tanaka Kakuei (1918-1993) was dubbed the "Naniwabushi minister". In 1957, Tanaka was appointed the Minister of Posts and Telecommunications in Kishi Nobusuke's first cabinet. Already notorious, and influential beyond his age, the young politician from Niigata got a lot of attention on the airwaves, then still mainly radio. NHK, aka as Japan Broadcasting Corporation, invited Tanaka to appear on a radio interview. In the course of the interview, Tanaka said he liked naniwabushi and was pressed to recite an example. Tanaka launched into Tenpo Suiko den, and soon the whole nation was hearing Kishi's youngest cabinet minister eulogize a bunch of gamblers who tossed around gold coins and killed each other. Unable to stop him, NHK pulled the plug -- and even the Diet debated the propriety of Tanaka's impromptu performance. The negative attention from elites who looked down on him only enhanced his image and status as a new folk hero. Primary: Publication under review in Yosha Bunko, and Japanese Internet sources. Secondary: Segi 1985:32 plate 1; van den Ing and Schaap 1992:37 plate 13.11, 102.